The iPhone just got a a ringing endorsement from one of Hollywood’s top directors. 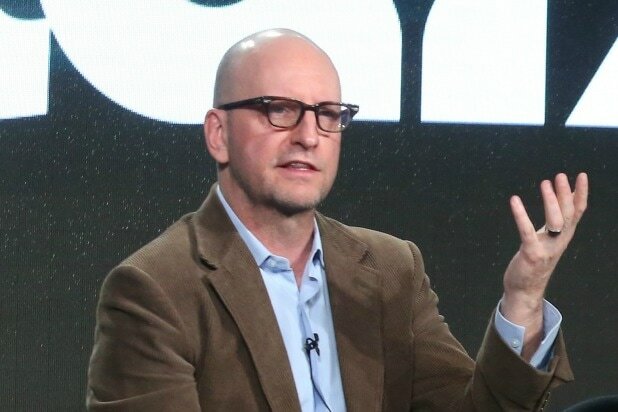 Steven Soderbergh shot his upcoming thriller, “Unsane,” exclusively on an iPhone — and he’s more than happy with the results. Also Read: Steven Soderbergh's 'Mosaic': What's the Difference Between the App and HBO Show? Prior to his newfound love for Apple, the man behind “Ocean’s Eleven” and “Magic Mike” had preferred the upscale RED cameras. Soderbergh’s endorsement gives those not-subtle “shot on iPhone” billboards an extra punch, but he’s not the first filmmaker to make the leap. 2015 Sundance hit “Tangerine” was shot on an iPhone 5S, and “Searching for Sugarman” won an Oscar for Best Documentary in 2013 with scenes recorded on an iPhone. If you’re looking see if “Unsane” does indeed look like “velvet” on the silver screen, it’s coming out on March 23. Elba turned up at TAO later on Saturday night as one of the featured head-turning guests. Johnny Damon and Tom Felton also made the scene at The Yard, where Don Julio's top-of-the-line 1942 magnums anchored the VIP tables. Organizers begged people who were not on the list to get Ubers to avoid being stranded outside in the cold. They put out several PSAs during the day on Instagram to ease congestion after a crowd of several hundred waiting outside in the snow on Friday night tried to get access. Post Malone burned the promoters at Park City Live. After performing a sold out show there earlier on Saturday night, he made a second (unannounced) stop at Tao, rolling in at 2 a.m. with a sizeable entourage. They took over the DJ booth from DJ Politik to perform "White Iverson" and "Congratulations." Posty's next stop: Coachella in April. The Black List founder Franklin Leonard captured a historic meet-up: #OscarsSoWhite founder April Reign (left) and #MeToo Founder Tarana Burke linked up at a Black List event. "It's blurry, but I don't care," Leonard wrote. "The culture deserves to see these smiles, blurry or not." Seeing digital cipher Poppy in person is an odd experience because there are no cracks in the "part-android/part-human" performer online. She headlined YouTube's house party on Saturday night, a party where people actually danced. Sam Ronson DJ'd the bash. Poppy will remain in the snow for a few days, as her new YouTube Red Original series "I'm Poppy" debuts as a festival selection on Tuesday. A view of the line outside on Saturday night. Google/YouTube Space on Heber is a two-story venue that has been a restaurant and the home of NBCUniversal's parties in the past. YouTube is not crashing the Sundance scene. This is the sixth year that they have been the official sponsor of the festival's Shorts program. Paul Oakenfold was not the one "Really Cool Dude" at ChefDance's "49 Remarkable Women + 1 Really Cool Dude" event (though he was there) on Saturday night. The "1 really cool dude" was Scooter Braun. Gloria Allred addressed him from the podium: “Scooter, you’re the one cool dude, because I've sued all the rest." Geena Davis threw a party to promote her Bentonville Film Festival, an emerging event in Arkansas each May that focuses on female voices in cinema. Here, Janina Gavankar of "Blindspotting," Anika Noni Rose and Colman Domingo (both of "Assassination Nation") enjoy Davis' hospitality inside the DIRECTV Lodge presented by AT&T. Remnants from the Respect Rally earlier in the day -- like signs and Planned Parenthood pink buttons -- floated around Park City on Saturday. Here, Caren Spruch, Melanie Lynskey, Jason Ritter and Dawn Laguens were still rally-ready at "The Tale" party that night. After the march, people ducked into bars to get out of the snow and slush. Here, Bridey Elliott and Haley Joel Osment found Rock & Reilly's hideaway. As one of the last places slinging swag in the post-gifting suite era, Roku handed out the Streaming Stick+ to some VIPs. Aubrey Plaza was the toast of the 2017 festival by stalking Elizabeth Olsen in "Ingrid Goes West." This year, she came to support Chloe Sevigny at the after party for "Lizzie," one of the buzzy titles around town. 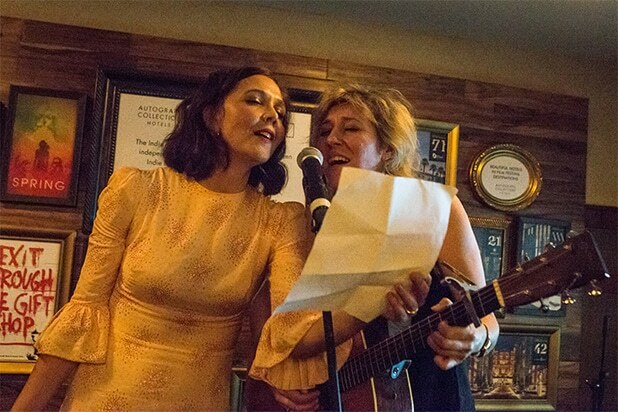 The Lizzie Borden story, about the woman accused of killing her father and stepmother in Massachusetts in 1892, had a packed party Friday night at Cafe Artois. Molly Shannon and Kathryn Hahn hug it out at the DIRECTV Lodge presented by AT&T on Friday night. L.A.'s prom king Jeffrey Best (event production designer) built out a gorgeous three-room space that also included a pop-up of industry favorite, Craig's. "Scandal's" Bellamy Young and Ed Weeks took a break at Debbie Durkin's Ecoluxe Lounge, the last gifting suite of a bygone era of freebies in every nook along Main Street. Moviepass has its diehard devotees. Mitch Lowe's all-you-can-watch theatre pass leveraged that in to a Park City estate rife with cast dinners and celeb sightings like Aubrey Plaza, Jermaine Clement, and Priyanka Chopra during the opening weekend. Here, the boss (right) poses with Craig Robinson. Women In Film President Cathy Schulman chatted with Tessa Thompson about the state of women in the entertainment industry at the Friday night dinner at the DIRECTV Lodge presented by AT&T. After Sundance, WIF announced that Emma Stone will be co-hosting their event toasting female Oscar nominees on the Friday night before the big show. Nadja Swarovski, Kenneth Cole, Lucy Walker, and UCLA TFT Dean Teri Schwartz huddled at a private screening of the documentary 'Waterschool' on Jan. 20. Dean Schwartz was there because the film was created by UCLA TFT graduate students in partnership with Swarovski. Right after this event, the film traveled to Davos, where it to be screened at the World Economic Forum later in the week. DJ Frodo (Elijah Wood) spun at Wanderluxxe's house in Deer Valley, where several festival talent escaped the crowds on Main Street. Wanderluxxe is a concierge service founded by Marti Hines and Lola Wood. A brass band, with a washboard player, drums and a parasol celebration warmed up Sundance's slow second weekend with the 6th Annual Louisiana Film, Music & Cuisine celebration: Mardi Gras Muses. Inside, the star of Ethan Hawke's "Blaze," Ben Dickey, and the director himself were the marquee talent. Dickey won the special jury award for acting. The Louisiana International Film Festival takes place April 19- 22, 2018 in Baton Rouge.